Recently, Star Wars action figure fans were all flustered by the shocking news that a highly anticipated Princess Leia figure had suddenly vanished from preorders and distribution lists. For once however, this wasn't another example of Hasbro's ongoing female Star Wars figure problem. 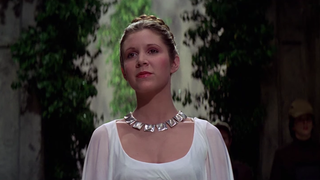 The STAR WARS Black Series 3.75-inch Princess Leia (Yavin Ceremony) has been delayed due to a production issue with Princess Leia's robe. However, we are currently working through this issue and you will be able to find her on shelves later this year. Also, we can confirm that the STAR WARS Black Series Princess Leia (Boushh Disguise) 3.75-inch and 6-inch items will be available later this summer. In addition, you can find a STAR WARS Saga Legends Princess Leia (Endor) 3.75-inch as well as a STAR WARS Mission Series Princess Leia (A New Hope) 3.75-inch on shelves later this spring. So alls well that ends well, even if it means people will have to wait a while to get their Princess Leia toy. But even though it wasn't a big mistake made by Hasbro, they didn't exactly handle it in the best manner — suddenly yanking the toy without a reason given, and only explaining it (with a completely reasonable response) after people got angry and assumed the worst. None of this would've happened if they'd just announced the figure's delay and then pulled it. The fact that people now assume the worst when it comes to Hasbro's female figures just compounds on their ongoing issues with Star Wars toys too. Hasbro's reputation has gotten to the point that when something like this happens, people expect it to be more of their shortsighted shenanigans, rather than an honest complication. That's not a great thing, especially as Star Wars toys are on the cusp of exploding once more thanks to The Force Awakens coming out later this year. But hey, maybe if they had more female figures out there in the first place fans wouldn't freak out the moment one of the handful Hasbro have planned is delayed.